This is a summary of what was said by UNHCR spokesperson Jennifer Pagonis - to whom quoted text may be attributed - at the press briefing, on 31 August 2007, at the Palais des Nations in Geneva. Since December 2006, over 20 such IDP sites have mushroomed in North Kivu province as the capacity of host families to take new arrivals has been exhausted. We are increasingly concerned by the spiralling displacement and atrocities in eastern DRC. With heightened tensions and the build-up of military forces, the situation risks turning into a humanitarian and human rights disaster. According to our teams, more displaced people continued to arrive at various sites over the past days, as Congolese in many villages of Masisi and Rutshuru districts fear clashes between regular DRC government forces, renegade troops resisting integration into the regular army and various rebel groups. Internally displaced people in Mugunga say they fled fearing fighting and an escalation of violence, not because of direct attacks. Since Monday, some 600 displaced people found shelter in over-crowded conditions in a school building close to Mugunga. The displaced at the Muganga site are living under precarious conditions on volcanic rock. In 1994, Mugunga was the site of a humanitarian tragedy, when hundreds of thousands of Rwandan refugees fled to the area in the aftermath of the Rwandan genocide, forming one of the largest refugee camps at that time. Access to the displaced people is a problem for humanitarian agencies because of the worsening security situation. Whenever possible, our field monitoring teams are regularly visiting displacement areas to assess the needs. In order to improve living conditions at the Mugunga site, UNHCR organized training yesterday for IDP leaders and local authorities in Mugunga, focusing on camp management. Our teams provided guidance on distribution of water, maintenance of shelters and latrines. Other UN agencies and NGOs are also rushing to provide household items and food rations to those displaced at Mugunga and other sites in North Kivu. 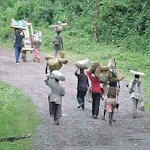 We are currently planning more projects to improve living conditions in IDP sites in North Kivu. Since December 2006, an estimated 180,000 Congolese have been newly displaced in North Kivu, including refugee movements across the border into Uganda. The latest was reported last week when some 10,000 Congolese fled to Kisoro district in south-west Uganda. In total, there are now more than 650,000 internally displaced in the North Kivu province.